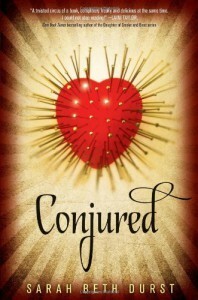 3.5 stars.Conjured is definitely unlike any other book I have read. We find out that Eve is part of the Witness Protection Program but we get very little background as to why….at first. 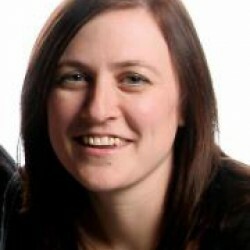 Sarah Beth Durst did a great job of exposing bits and pieces of the story throughout the novel by revealing things to Eve. See, she doesn’t remember anything prior to being placed with the Witsec agents and other than knowing that the story includes magic and the killer she is being protected from is a magician, Eve is just as in the dark as the reader.Eve is a likable character but I didn’t love her. I thought she allowed people to dictate her actions too often – perhaps this was a side effect of her memory loss but in hindsight, it is possible that it was due to her role in life prior to being placed in protection. There were times where she took charge but it wasn’t very often.I enjoyed Zach as a character. I fully support a nerdy guy who spouts out useless facts. On top of this, he is very honest (he truly never lies) and the way he introduced himself to Eve for the first time won me over completely.Throughout the story, Zach is the one who centers Eve and helps her realize who she is. When she realizes that doing magic causes her to blackout, she tries not to do it at all but then surprisingly, she finds Zach can do magic through her and that changes everything. It definitely draws them closer together and creates this sense in Eve that he is someone she can trust.I do wish we had learned more about these magical worlds. Although at the end we were given some insight into how the trial process went, we didn’t get much exposure to these magical worlds as well as much detail behind Aiden’s quest. I honestly would have liked to know more about him, his world, and why he thought Eve was truly the answer…outside of her magic.If you are looking for something different, this may be the book for you. As I mentioned, I don’t think I have read anything like this before and that is honestly what made this book stand out for me. I thought the story was well paced and kept me interested in what was going to happen next. If you like magic, a bit of romance, and some mystery…check this one out.